Includes support for opening FlowDocument, Docx(text only), Html and plain/rich text formats and support for saving FlowDocument, Docx(text only), Html and plain/rich text formats. Multiple tab interface so you can edit more then one document in a session, Tab Rearranging support, compact application size, and multiple Edit/Insert/Format commands. Multiple startup options like Open New Document, Load Previous Documents, Do Nothing and more. supports editing commands like undo/redo, cut(and cut paragraph, cut line), copy(and copy paragraph, copy line), paste(and paste text only), delete(and delete paragraph, delete line), select all(and select paragraph, select line), find, replace and go to. Insert objects, images, links, text files, symbols, tables, videos, horizontal lines, date, time, headers and footers into your documents. 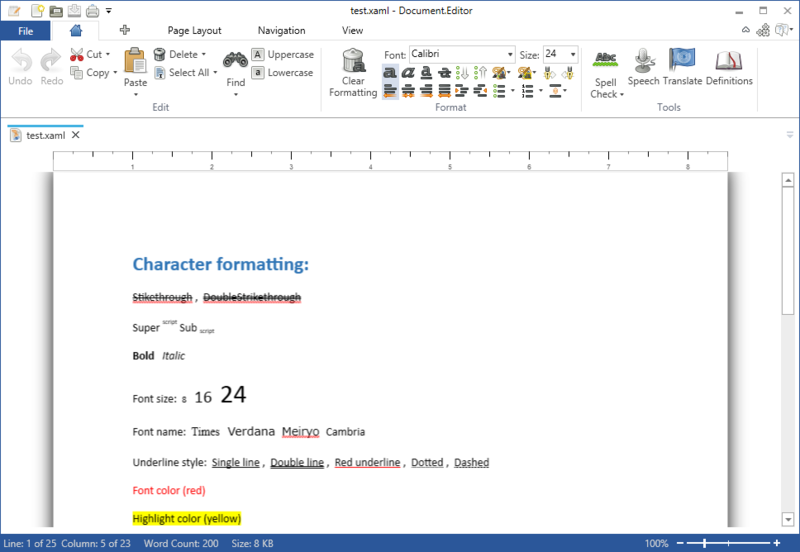 Document.Editor also supports Spell Check, Text to Speech, Translate and Definitions. You can also export documents to WordPress, Xps, email, ftp server, zip archive, image or sound. Document.Editor includes a system that you can make your own plugins with, but it is turned off by default. You can turn it on in the options dialog. At the moment it only supports inserting text into a document but will later support other things like images and tables. Take a look at the HelloWorld plugin to see the basics. More help for plugins coming soon.